I didn’t realize that Quito’s international airport was so far from Quito (and a whopping $35 taxi ride into the city! 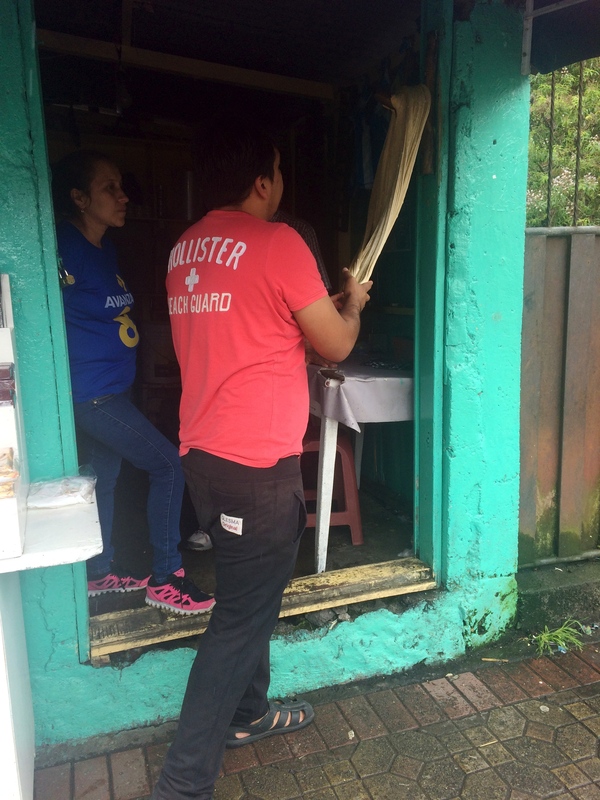 ), and because we wanted to go straight to Baños after the Galapagos, we spent the night in Pifo instead of Quito. 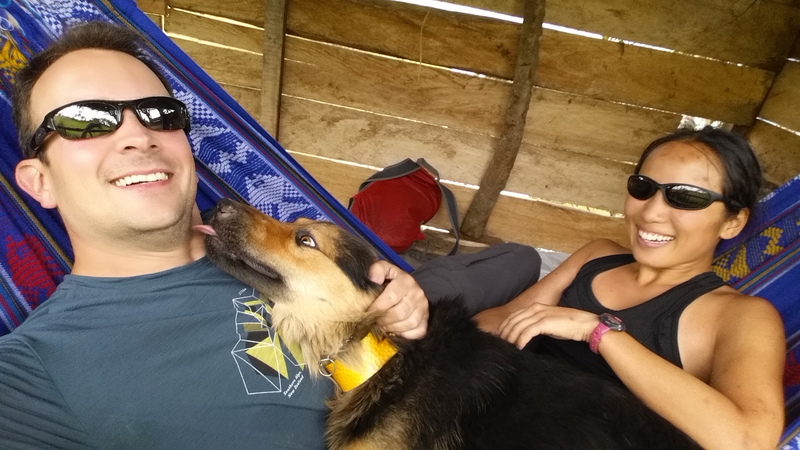 The cab ride was $10, and the driver dropped us off at a nice hostel in Pifo at $20/night. I highly recommend this route for those arriving to Quito airport who immediately want to skip Quito and head south. Early the next morning we took the bus from Pifo to Ambato for about $2 each, and transferred to another bus for Baños for $1.50. We arrived to our hostel before noon. 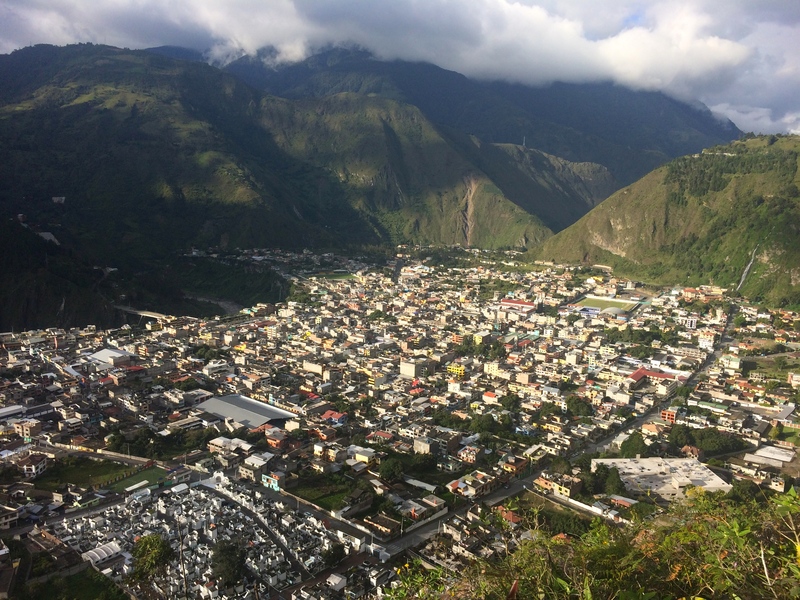 Albiet touristy, everyone says Baños is a cool little mountain town worth visiting for a couple of days, primarily due to the vast number of possible adventure activities within range. The town is dramatically set atop a ridge with lush mountains on one side and a cliff on the other. Waterfalls can be seen within town flowing from the hills high above, and pouring down into the canyons below. Despite being near the equator, its elevation of ~2,000 meters promises mostly cool days and overcast skies. 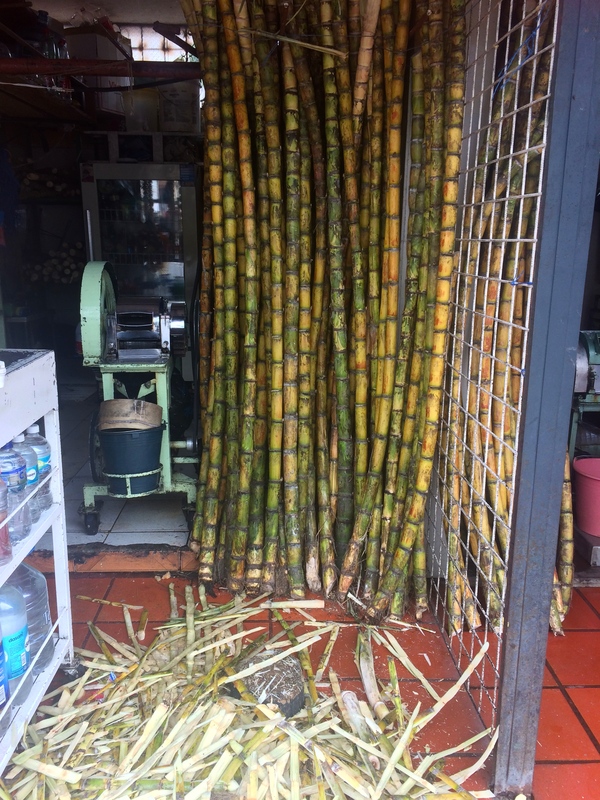 Sugarcane (caña) is abundant in the area and can be found in the form of taffy, bundles, and juice. 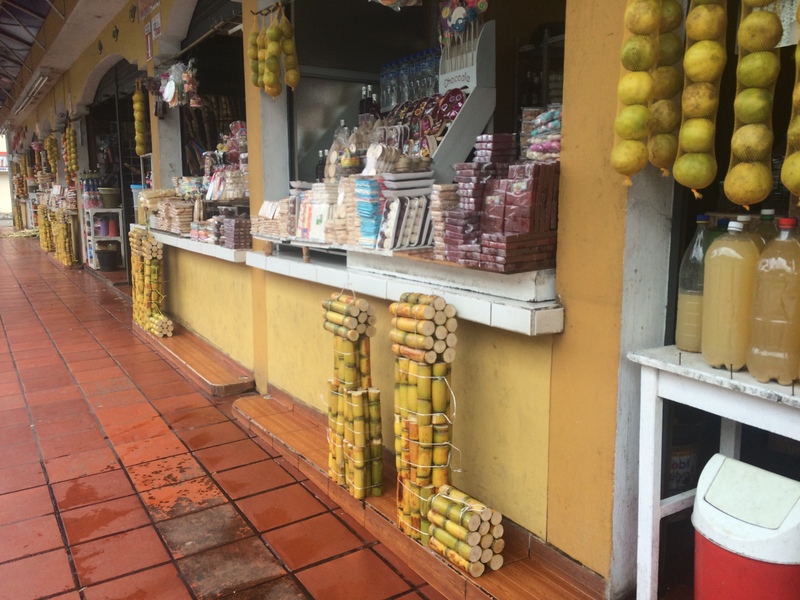 Men could be seen stretching the local specialty of sugarcane taffy on all corners of the streets. 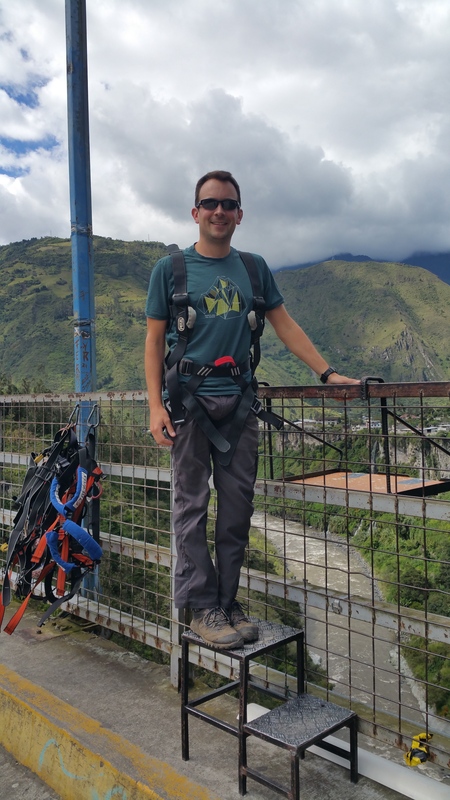 During our short stay we visited the picturesque La Casa del Arbol and magnificent Pailon del Diablo, and we both gave a shot at puenting and canopying. 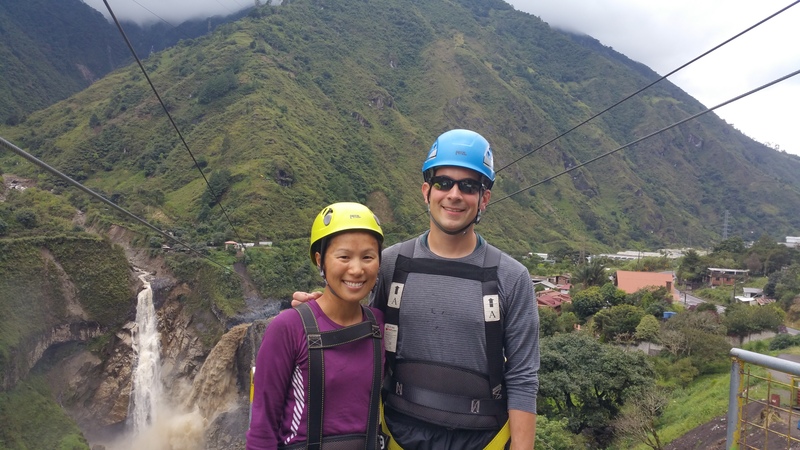 Other activities in the area that we did not participate in include horseback riding, white water rafting, canyoneering, paragliding, rappelling, and soaking in natural hot baths. 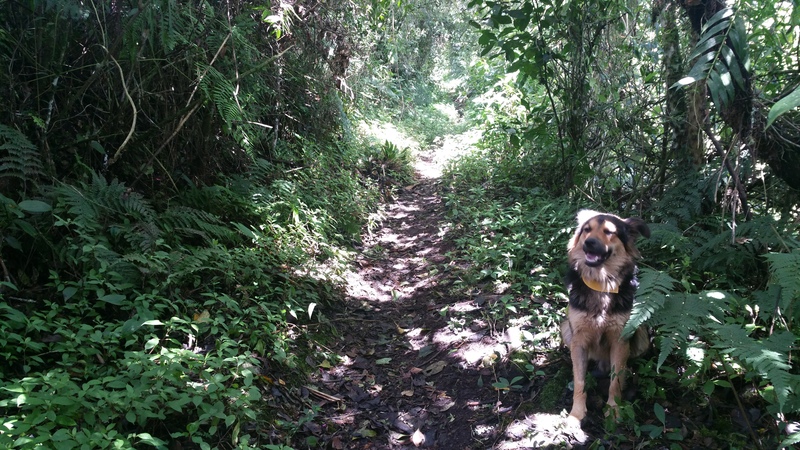 Instead of taking the $1 bus to La Casa del Arbol (The Treehouse) we opted to hike up the hill, which took only 2 hours. Along the way we made a new friend, who actually followed us all the way to La Casa. 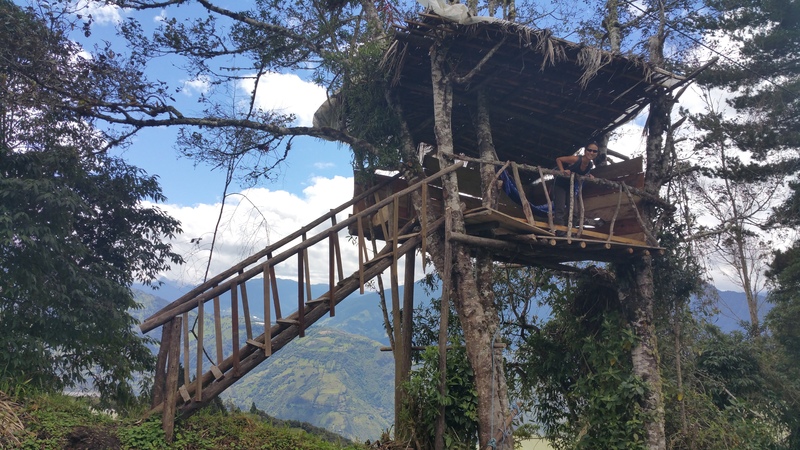 Not far from the famed Casa del Arbol was another tree house, but with a hammock, and it was vacant! Almost everyone takes the bus up, so they pass this adorable little tree house. We had it all to ourselves. Our furry friend joined us too. 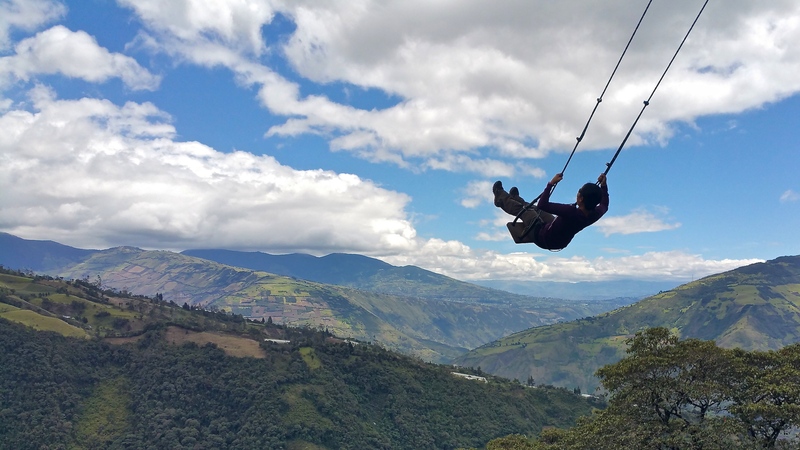 And finally, we walked over to La Casa del Arbol with its “must-do” swing over the hill into the beautiful vista of the active Tungurahua volcano. The entrance fee is $1, and there is typically a line with maybe 3-6 people who want their turn on the swing. For the majority of visitors, the dramatic landscape with the volcano in the distance is obscured with clouds and fog. We were somewhat lucky in that the volcano was only partially obscured. Swinging out into the open was soothing and liberating. After swinging over the hillside, we made our way back down into town via bus for $1. Buses are infrequent (departures are at 12 and 4); there may be a couple more departure times, but I’m not clear on when they are. We were lucky that we arrived at 11:15am in order to return via the noon bus. 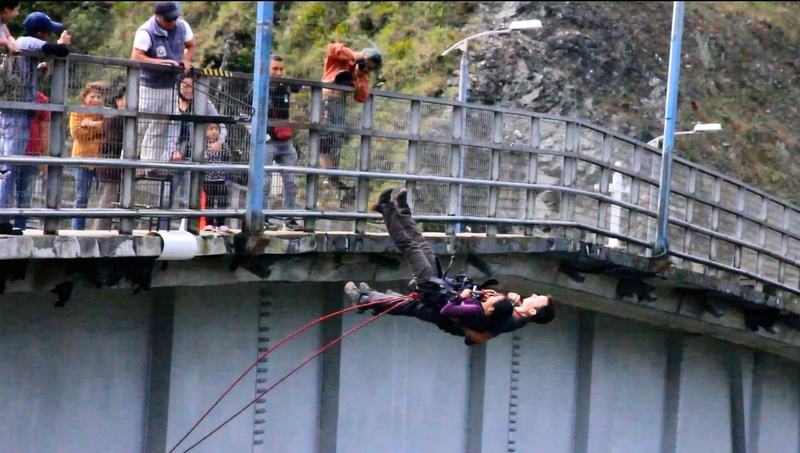 The next plan was to check out San Francisco Bridge, the highest bridge in town, for puenting. 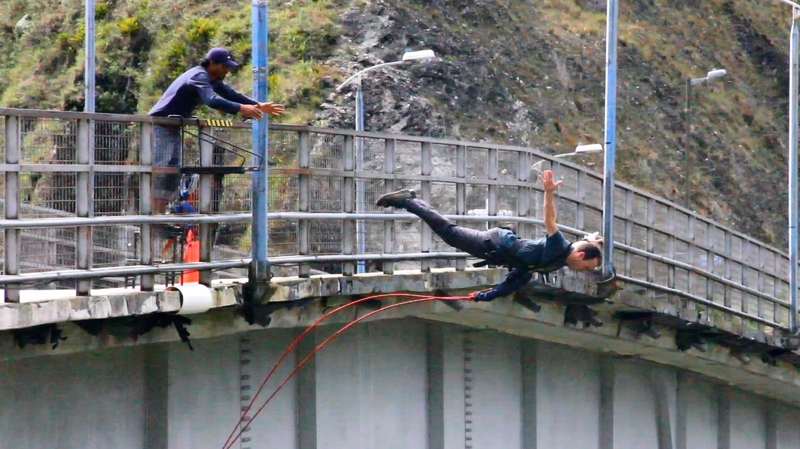 Puenting, or “bridging,” is kind of like bungee jumping, except you are attached via body harness rather than the legs using a rope instead of a bungee, and you end up swinging side to side instead of bobbing up and down. 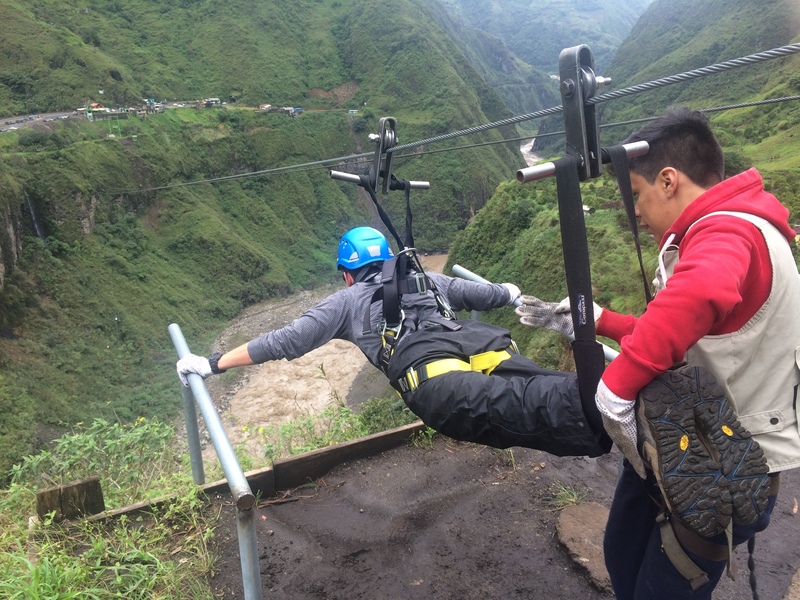 I had read about puenting prior to my arrival to Baños and I thought I would freak out due to my fear of heights. A couple of girls freaked themselves out and stepped down. Truly, there is a simple secret to it: Just don’t think about it. Instead of pondering over all the unlikely “what if’s”, I just focused on how much fun it would be. 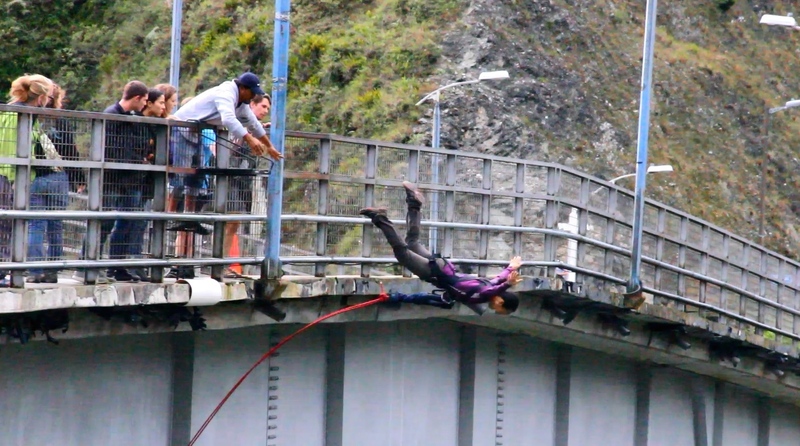 I mean, after all, it was just a bunch of dudes standing on a bridge with a bunch of harnesses, right? No forms, no waivers to sign? AND it’s super cheap at only $20 a jump. HA! Chris made me jump first because he was worried I wouldn’t jump after he did. We had such a great time, we opted to go a second time. Our second jump was $15/person. After having done both, I recommend jumping solo instead of with a partner. 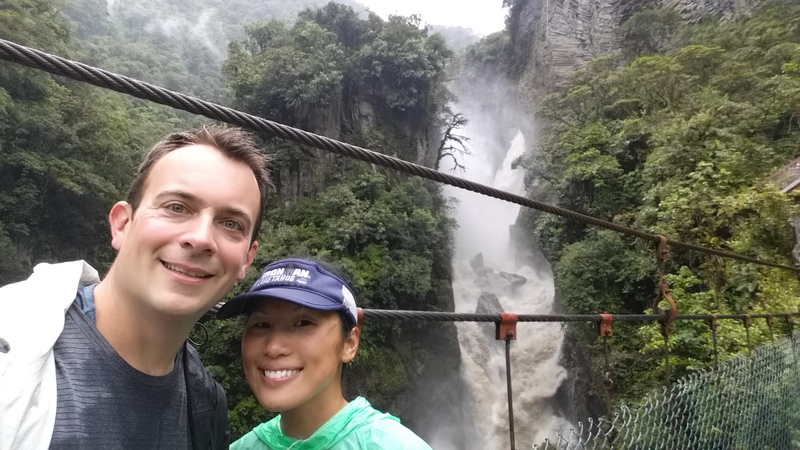 Another awesome half-day is the bike ride to Pailon del Diablo, or “The Devil’s Cauldron,” the most spectacular waterfall in the area. 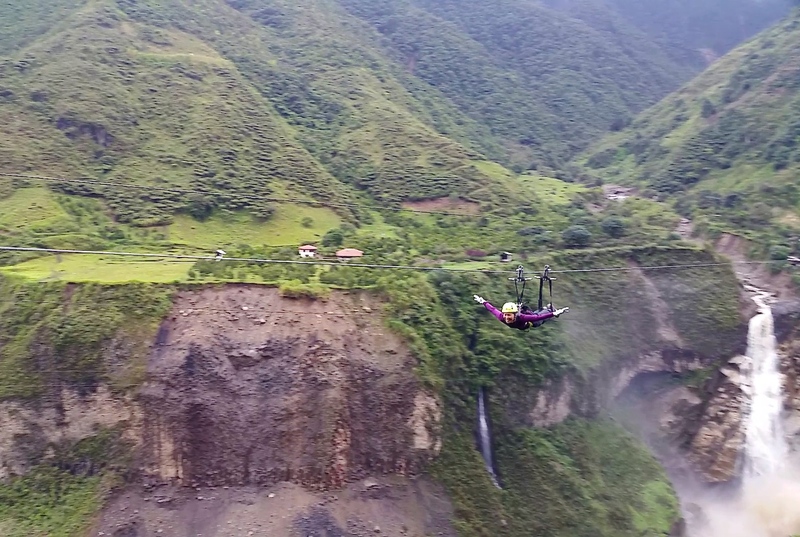 The mostly downhill 18-km bike ride to Pailon del Diablo takes one through scenic hillside landscapes abundant with even more waterfalls, and at least 5 zip-lining/canopying options. The opportunity to canopy was too convenient. 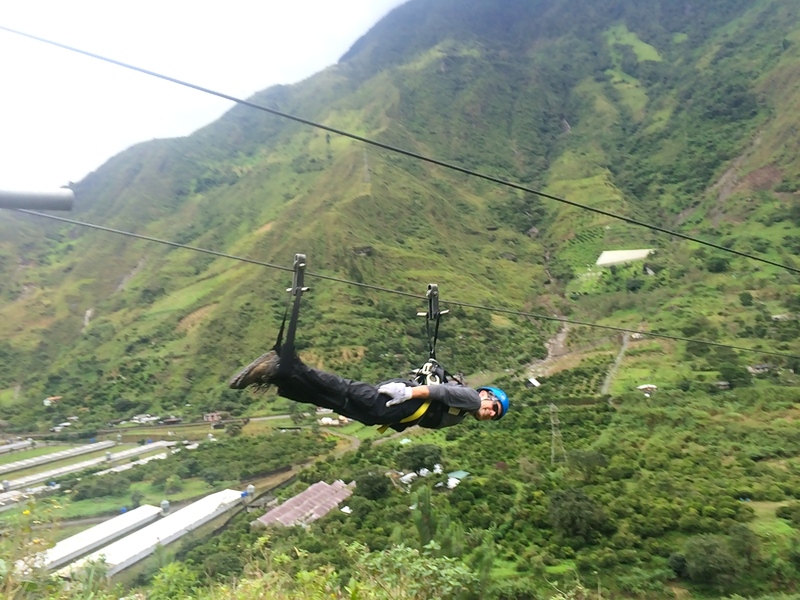 We pulled over for a quick $15 roundtrip canopy ride over the valley. 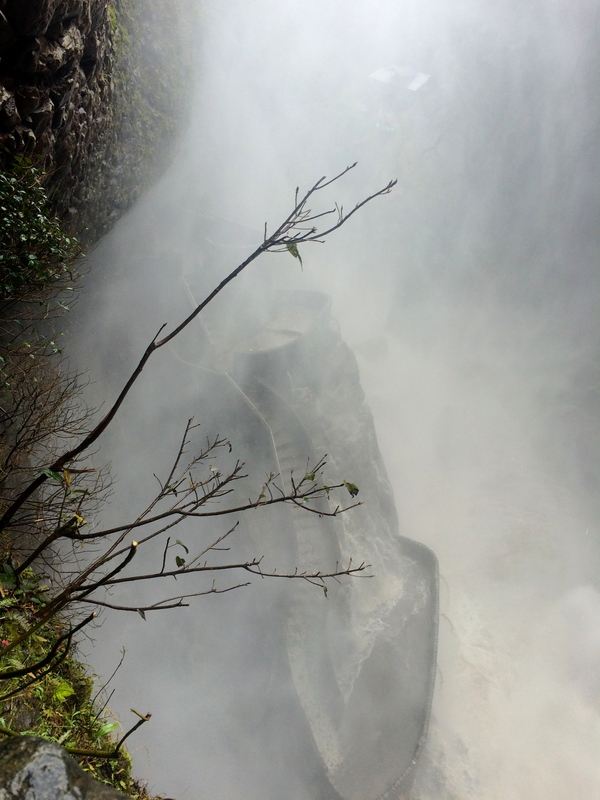 After the quick canopying excursion we continued our way east toward Pailon del Diabo. 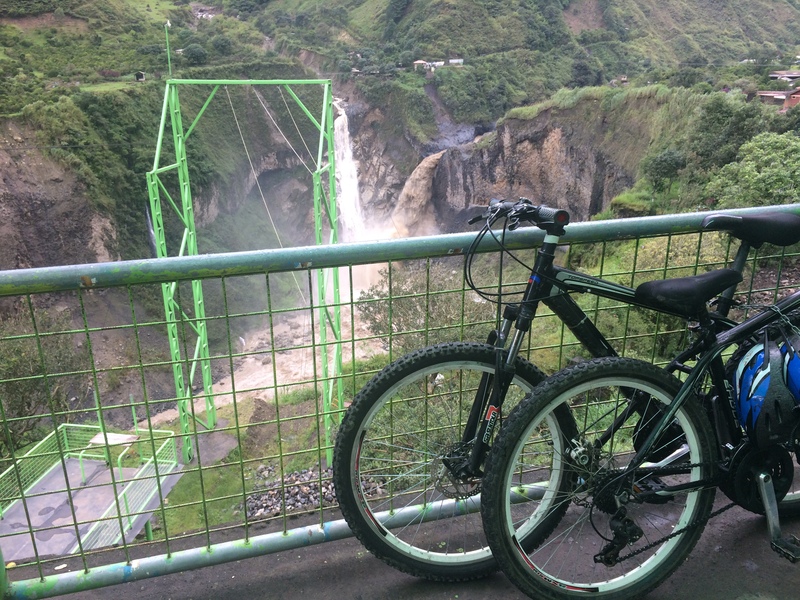 Bike parking was free at the parking lot, and it was a quick 2-km hike down (and a $1.50 entrance fee) to one of the most spectacular waterfalls in Ecuador. Because it had been raining, the already-insanely-powerful waterfall was extra insanely-powerful. No words can describe the experience of the torrential downpour of mist, the powerful wind blast, and deafening waters. 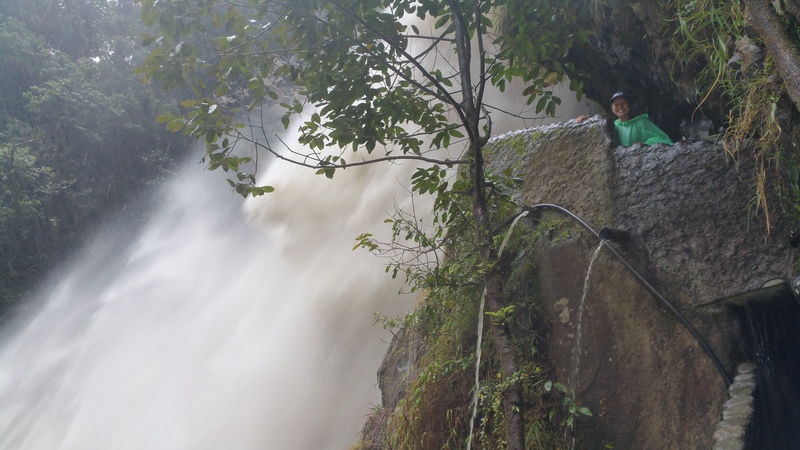 It was actually a bit frightening as we were able to approach the waterfall from behind and literally be inches from the cascade after crawling through a narrow, rocky crevasse. 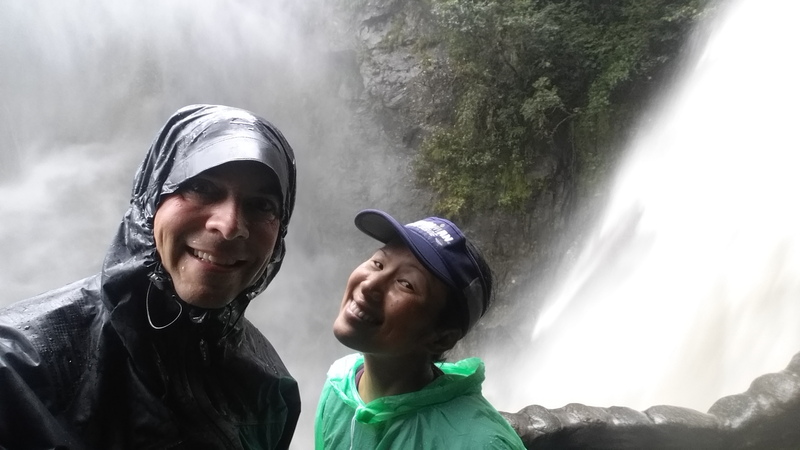 We were utterly drenched and barely audible even shouting over the roaring cascades. Normally, this walkway could be visible and walkable. Definitely not that day! We soaked in Mother Nature’s power and finally tore ourselves away to dry off. This is what the waterfall looks like from a distance. 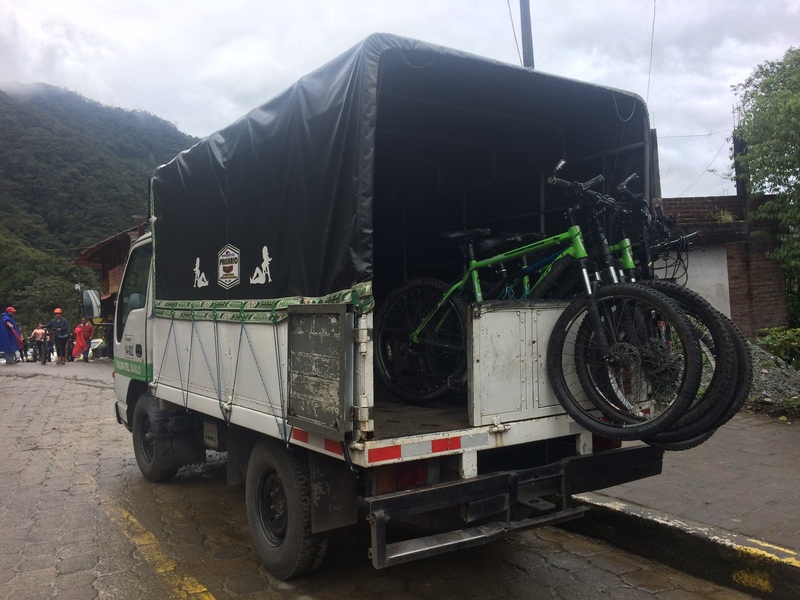 Our morning of biking, canyoning, and waterfall-ing concluded with an easy $2/person ride back up to Baños on the back of a truck. Good thing we finished too. The light morning drizzle increased to a light rain by the time we returned to town, where we spent the rest of the gray afternoon sipping cappuccinos in a cozy cafe. 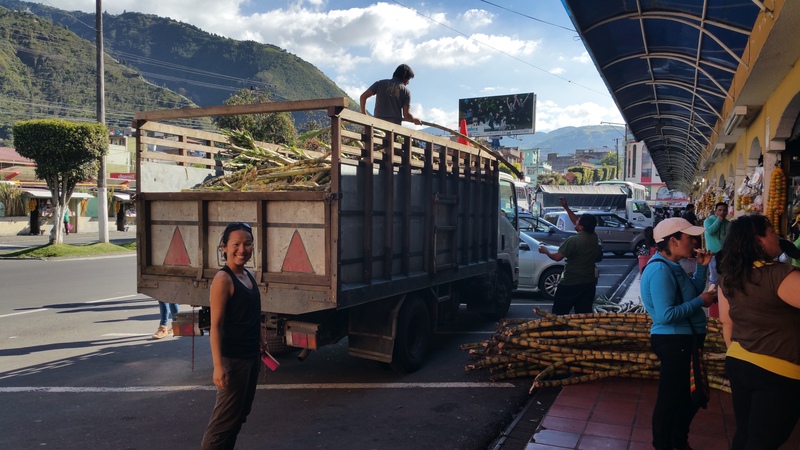 With local delights such as sugarcane taffy, a plethora of outdoor activities, and outstanding restaurants and cafes, we could have easily spent more time here. 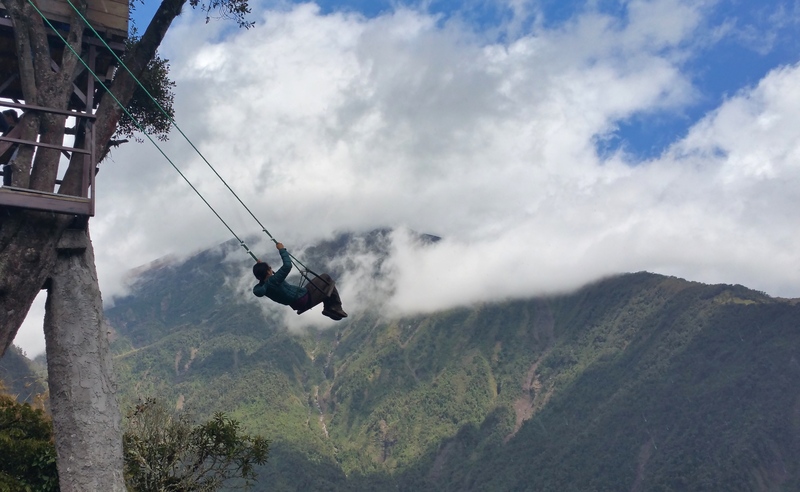 Two whole days should be the minimum for beautiful Baños; we were glad to have swung the treehouse swing, puented, canopied, and soaked in Pailon del Diablo in the limited amount time that we had. 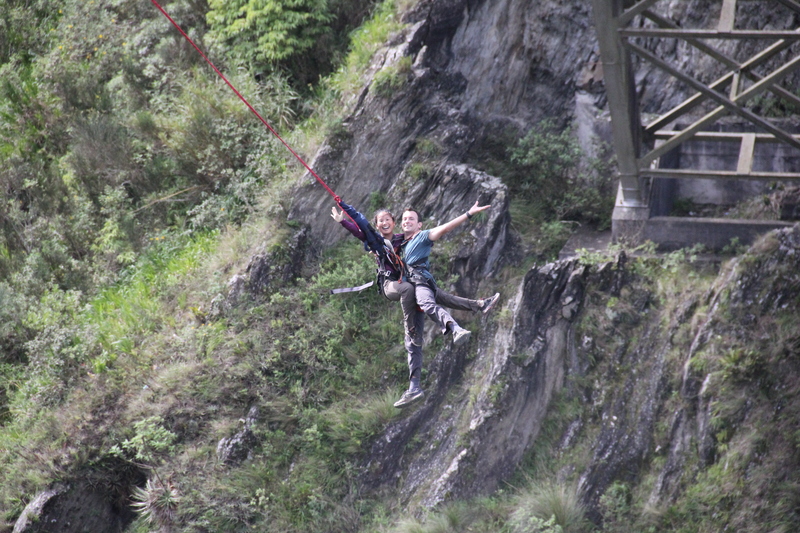 This entry was posted in Ecuador and tagged la casa del arbol, pailon del diablo, puenting. Bookmark the permalink. Sounds like an action packed trip! Did you skip Quito for any particular reason? We skipped it first because we’d be returning to Quito later on. But we also prefer areas with biking/hiking/camping opportunities over big cities when traveling.